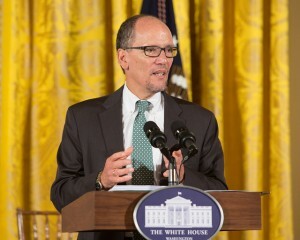 Labor Secretary Tom Perez (above) said the rule is part of an effort to boost middle class wages. Millions of workers will soon be eligible for overtime pay under a new rule finalized Wednesday by the Department of Labor (DOL). The rule takes effect Dec. 1. The rule states anyone making less than $47,476 per year must receive time-and-a-half pay for hours worked beyond 40 hours per week, roughly double the current threshold of $23,660. The salary level will be increased every three years, starting in 2020, to match inflation. The rule will make 4.2 million salaried workers newly eligible for overtime pay, NPR reports, and could affect millions of others who are technically eligible but not receiving overtime. Overall, the Economic Policy Institute estimates that 12.5 million workers will benefit from the new rule. The National Association of Landscape Professionals released an alert yesterday summarizing the rule and stating that it had joined the Partnership to Protect Workplace Opportunity Coalition, which educates members of Congress about concerns regarding overtime changes. 2 Comments on "DOL: Millions of workers soon eligible for overtime pay"
It will be interesting to see how many employers reduce the hours of affected salaried people to avoid paying overtime, how many increase salaries to above $47,476 ($915 per week or $22.825 per hour), and how many will change to paying hourly with overtime. By the way, a person working 45 hours on average making $16.41 per hour will earn $47,465.93 annually. Employers should not only consider the financial impact of this change but also the expectations of salaried people, average hours, seasonal effects, quality of life, and other issues. Employers who handle this transition poorly run the risk of losing good people at a very bad time of year to have turnover among salaried staff. Many salaried people work overtime without approval, because there was no financial impact of their working extra hours. Now, there may be approval processes put in place before overtime work is assigned and approved for pay.